HOUSTON, Texas. According to one researcher, casual disrespect of women in the workplace can actually harm women’s health. Almost every woman has experienced sexual discrimination and harassment at some point in her life. It’s the cat call on the street, the co-worker who always interrupts you in a meeting, it’s the hallway you avoid because it’s near the guy who asked you on a date after last year’s Christmas party. All of these small acts can leave a major impact on women’s health. According to the Atlantic, women who suffer from regular discrimination on the job can end up with higher blood pressure. Discrimination can have an impact on a person’s sleep cycle, cardiovascular health, and weight. Researchers compared women in a longitudinal study, looking at health outcomes of people who experienced discrimination rarely and those who experienced discrimination more often. The researchers found that those who experienced discrimination “often” or “sometimes” had worse health outcomes than those who experienced discrimination rarely. Researchers found that women who experienced more discrimination had higher blood pressure by two systolic units. Why is this significant? Researchers have found that if Americans could reduce their blood pressure by this amount, they could reduce their risk of stroke or heart attack by as much as 10%. Poorer health has other costs, too. Women with poorer health may have higher medical expenses and may need to miss time from work to heal. This can impact their ability to get important raises or promotions. Women who experience more stress may eat more, which can lead to weight gain, researchers also found. Discrimination can also lead to more mental health issues. According to the American Psychological Association, discrimination-related stress can lead to depression and anxiety. According to the APA, as many as 7 in 10 adults will experience discrimination in their lifetime, with another 6 in 10 adults reporting that they experience regular discrimination. Discrimination can be based on gender, race, sexual orientation, or disability. Some individuals experience extreme forms of discrimination, including mistreatment from bosses who may discourage them from seeking a promotion or from advisors who may guide them away from certain jobs or career paths. If you have experienced discrimination on the job, you may be facing a range of challenges—from economic losses to increased stress as you navigate a changed workplace environment. You may be wondering whether discrimination might be impacting your salary, your promotion opportunities, and even your health. As more individuals fight back against discrimination, more companies are holding themselves accountable to provide equal treatment to all workers. 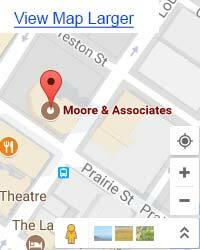 If you believe you may have been discriminated on the job, consider reaching out to Moore & Associates, Houston, Texas employment lawyers near you. Our firm may be able to help you seek damages for your losses to the fullest extent of the law. Visit us at https://www.mooreandassociates.net/ to learn more.